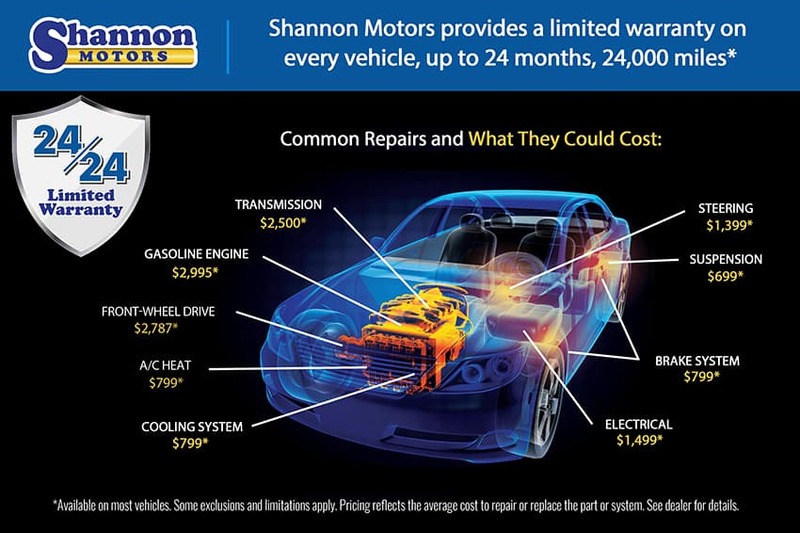 Shannon Motors provides a limited warranty on every vehicle, up to 2 years, 24,000 miles, while other dealers only offer 30 days. So after a month, you’re on your own. Not at Shannon Motors, we stand behind our vehicles. You’ll have peace of mind knowing if something goes wrong, we will be there to fix it! This extended limited warranty covers most major systems including the engine, transmission and suspension. Call or visit any of our four locations and ask a representative for details on our extended limited warranty today. Available on most vehicles. Some exclusions and limitations apply.